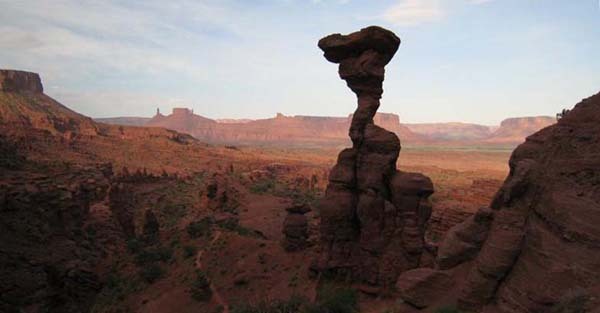 Despite this route being a true "mud climb" it is extremely popular and frequently climbed for one reason-The amazing and improbable corkscrew summit spire! 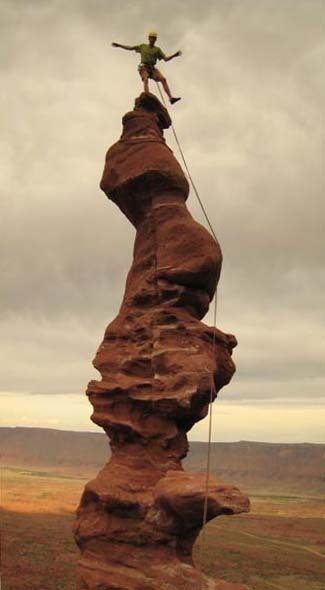 The final, super-exposed, thirty-foot summit spire is reached by an even more exposed twenty-inch wide, unprotected sidewalk. Simply awesome! When we pulled up to the tiny campground at the Fisher Tower trailhead on Monday night, all of the five campsites but one were full. We pulled into campsite #2 and paid our $10 for the night. Looking around at the other sites I tried to discern if the occupants were climbers. 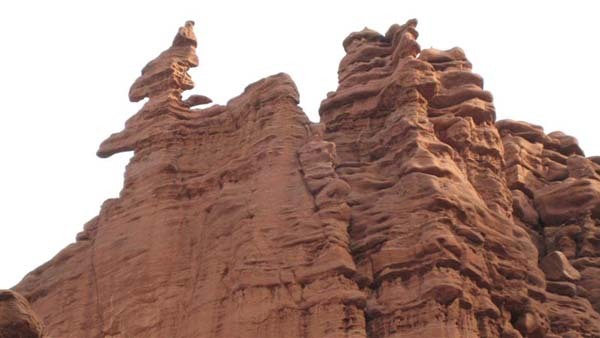 I concluded that three of the four sites contained climbers and got nervous. While I don't consider myself the fastest of all climbers, I've been behind enough slow parties to know that I'm plenty fast enough and I didn't want to get behind anyone else on this route with the summit pitch involving some time-consuming shenanigans that would really keep us waiting. With that in mind, Allison and I got completely packed up that night after dinner and set the alarm for 4:30am. We'd do the approach in the dark and wait at the base of the climb for it to become light enough to climb if were early. The night of sleep wasn't great for two reasons-first, the 80 degree air was almost completely still so even with a tent consisting of almost all mesh, it was hot! Secondly, I had been hoping to climb this route for years so I was filled with some anxious excitement! So when Allison woke me up a few minutes before 4:30am, I was ready to go! Getting up and leaving camp was an exercise in stealth. 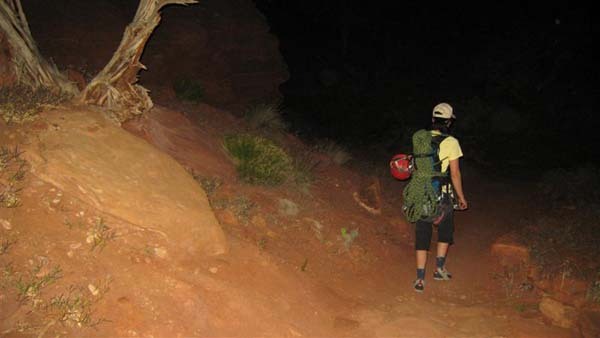 We didn't want to awake anyone else for fear of having them get the jump on us so we used the ambient light in the atmosphere instead of our headlamps, quietly unzipped the tent, gently opened and closed the car for our packs and tip-toed up the hill to the trailhead. No doubt we were being overly cautious but it didn't hurt and when we arrived at the base of the climb after the short 35 minute hike there was no sign of anyone behind us and certainly no one in front of us. Perfect! Pre-dawn approach to beat the crowds. We had a bit of time to kill before it was light enough to climb so we sat at the base and enjoyed the view. Just a few minutes before 6:00am we started climbing. At first the hardened mud seemed dicey but as I climbed higher I quickly learned what to look for and trust and soon enough I was at the crux "roundish dihedral" 5.10 section. There are three for four drilled angles hammered in this short 10-foot section that are often used for clipping and aiding from to surmount it. But my goal for this climb was to free the route given that the sections that are commonly aided are no harder than 5.11a. The cobbles embedded in the hardened mud made for nice holds and feet and I passed through the section without any major difficulty. I would say that for taller people the two crux sections on this route are easier than the 5.10+ that most say this goes at. I clipped one of the angles with an extra long sling in case Allison needed it to pull up on as she seconded the pitch. Allison followed the pitch efficiently and did end up using the long sling as an assist because she's shorter and found the climbing to be a bit more difficult. Allison making the moves through the first pitch's crux. The second pitch ascends a 5.8 mud chimney that protected pretty well and had good holds and secure stemming moves. A couple drilled angles on this pitch offer some security. Looking down the chimney of the second pitch. Near the top of the pitch I did a bit of squeezing but nothing hard enough for me to break a sweat or breathe too hard and belayed from the spacious, flat ledge just below the summit pitches. 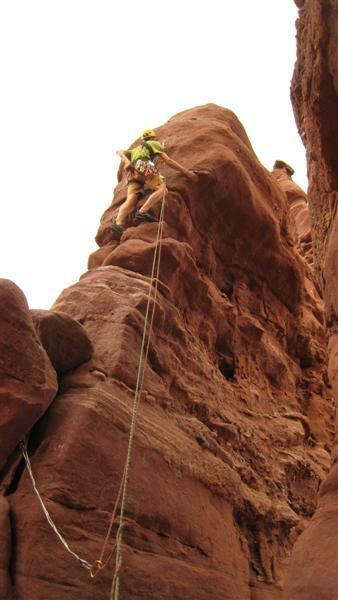 The third pitch is a very short pitch that gets climbers up on top of the exposed walkway to the summit corkscrew. 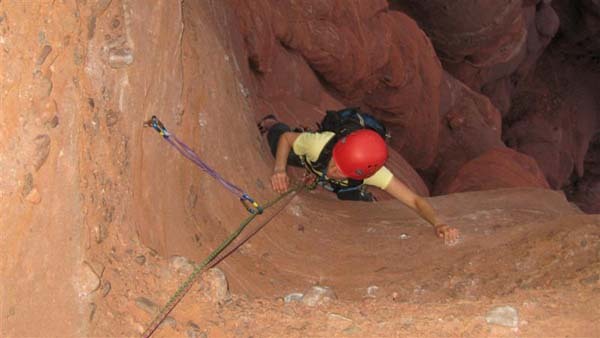 I placed a #9 Trango flex cam right off the belay before getting up to the face climbing just below the belay bolts. A few drilled angles on this face again offer the opportunity for some aiding but after looking around I was able to find enough small pockets, holds and cobbles to climb it clean to the anchors. One chalked-up, left hand hold that I almost used flexed as I started to weight it so I opted not to use that! Allison again used one of the draws to pull through this second crux section to avoid using the flexing left-hand hold! Getting ready to move through the third pitch's crux. Once on top of this pitch we had the awesome exposed view of the sidewalk over to the summit corkscrew. Now for the business! I gleefully but delicately walked across the sidewalk to the "diving board" at the summit tower's base. Getting on top of the diving board involves a solid 5.8ish mantle that must be easier for taller climbers like me. 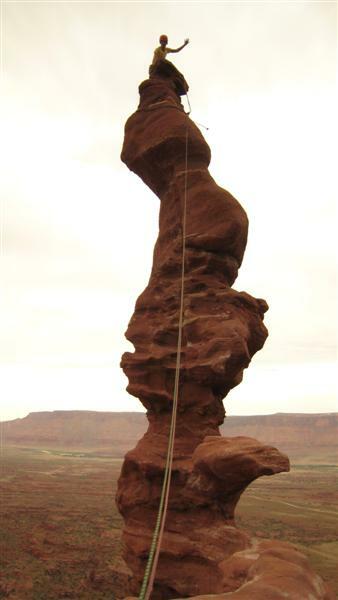 From there I moved up and right following three bolts and clipping them with long runners to avoid rope drag. Another high-step/mantle past the last bolt got me up top and even with the slings wrapped around the summit. I clipped a long runner around the slings and moved up for the top. The top of this thing is only about a foot wide! I conjured up the bravery and balance to stand on one foot for the "hero shot" and then backed down to the slings. Balance pose on Ancient Art's amazing summit. In order to setup a top-rope for Allison to follow up for her chance on the summit, I clipped directly into the slings, untied the ropes and fed them through the three rappel rings on the slings, re-tired and then down-climbed a bit while Allison lowered me back down to the sidewalk. I walked back across the sidewalk and setup to belay Allison over and up. While I savior and love exposure like this, Allison would be testing her comfort level a bit but I was hugely proud of her for doing this final pitch and going to the summit! She walked and crawled a bit across the sidewalk and then, being 5'5", avoided the mantle onto the diving board by traversing past it on the left and then moving up. The moves to the summit didn't give her any trouble and she popped out on top to give a wave for the camera before coming back down. Allison's turn on Ancient Art's summit! 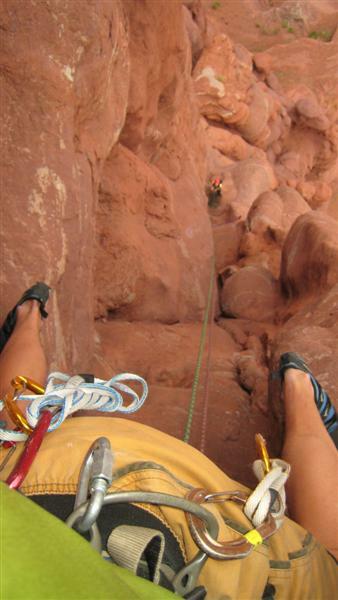 I lowered her down and she came back across the sidewalk to the comfort of the belay bolts! We both agreed that the sidewalk traverse is the spookiest part of the final pitch! Using beta from Gary Clark's naclassics.com, we avoided multiple rappels down the route by doing a single, rope-stretching, right-angling, double-rope 60m rap from the top of pitch three all the way down to just near the base of the first pitch. Rapping down this face it's impossible to not kick and break the fragile mud and I kept thinking how improbable climbing this route seemed! But it's just such and awesome summit that you must climb it! At the base of the climb we encountered one couple racking up to climb. Behind them another party was heading up the trail and arrived just as we left the base of the climb. On our hike out we encountered two other parties on their way up to climb the route and all of these groups commented on our early start and suggested they had done the same! We felt very happy with our decision to approach in the dark and climb the route right at sunrise! The precarious Cobra formation along the approach trail to the route. This can be climbed at 5.11R and the top looks like it'll fall right off! Back at camp we cooked up some egg, sausage and cheese breakfast sandwiches, brewed up some coffee and enjoyed the morning light before climbing Lizard Rock right by the trailhead and then heading to Castle Valley to climb the Kor-Ingalls route on Castleton Tower that afternoon.